It’s a new year. That means 90 percent of us have made a resolution to lose weight or be healthier, right? Las Vegas is a city that’s full of tempting, indulgent food so it can be hard to keep on track with your diet when you’re visiting, but it’s not impossible. There are actually lots of restaurants that offer healthier options and choices for people with dietary restrictions. We’ve put together a list of places to eat that just might help make 2015 the year that you actually stick to your resolutions. Bellagio Resort & Casino: If the thought of eating raw kale and carrots doesn’t sound appetizing to you (and really, does it sound appetizing to anyone? ), disguise the taste and drink them in juice form instead. Bellagio has recently added a selection of USDA-Certified Organic, cold-pressed juices to several of their dining outlets. The kale, beet and carrot juices are gluten-free and made from organic fruits and vegetables. The juice is actually made and bottled in-house by Bellagio’s culinary team with a hydraulic press juicer that extracts nectar directly from the pulp. That basically means the juice is full of nutrients and it tastes super fresh. The juices, priced at $12 each, are available for purchase at Jean Philippe Patisserie, Spa Bellagio, Palio, Palio Pronto, Café Bellagio and Café Gelato. The three flavors include: Balance, which is a mix of kale, cucumber, green apple, celery, lemon and ginger root; Energy, a blend of beet, orange, kale and cucumber; and Metabolize, a combination of carrot, orange and ginger root. Canyon Ranch Grill at Palazzo: Luckily, going to a spa is great for your health and when you leave the Canyon Ranch Spa, you can keep the healthy vibe going at Canyon Ranch Grill. The restaurant serves fresh, healthy cuisine, homemade soft drinks and juices and even organic and sustainable wines and beers. Hey, anyone that can make drinking wine and beer healthier is a winner in our book. Breakfast items include organic steel cut oatmeal, whole wheat pancakes and sprouted grain bagels. 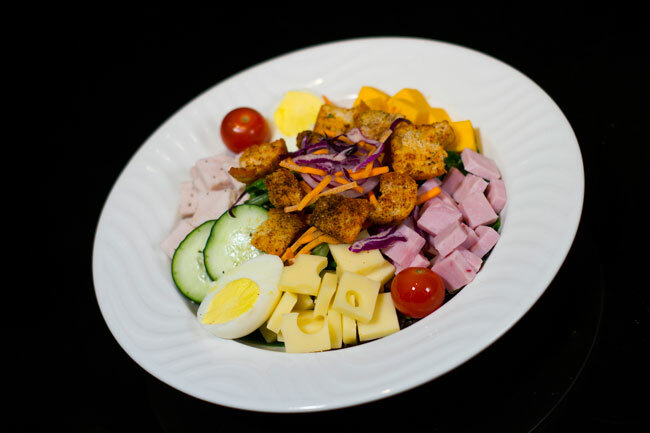 Lunch choices include Mongolian barbecued salmon, vegetable stir fry and a variety of salads. Wynn and Encore: Eating vegan isn’t always the easiest thing when you’re dining out, but it is at Wynn and Encore hotels. They offer meat and dairy-free vegan options at all of their restaurants. Just ask for a vegan menu. Society Café at Encore serves breakfast items like vegan French toast and Florentine Benedict made with tofu, spinach, English muffin, romesco sauce and tomato cucumber salad. Dinners include vegan pasta and the Wynn “burger,” made with Gardein patties and soy cheese. SW Steakhouse at Wynn might serve a lot of meat but there are plenty of vegan options too, like roasted quinoa cakes, asparagus and chanterelle mushroom risotto and herb crusted Gardein Chick’n. Jimmy Buffett’s Margaritaville at Flamingo Las Vegas: Got a gluten allergy? At Margaritaville, you don’t have to sacrifice great taste just because you’re eating gluten-free. The restaurant has a well-rounded gluten-free menu and all of those dishes are prepared separately to prevent cross-contamination. The delicious gluten-free buns are baked on-site, so if you’re looking for a cheeseburger in paradise, this is your place. 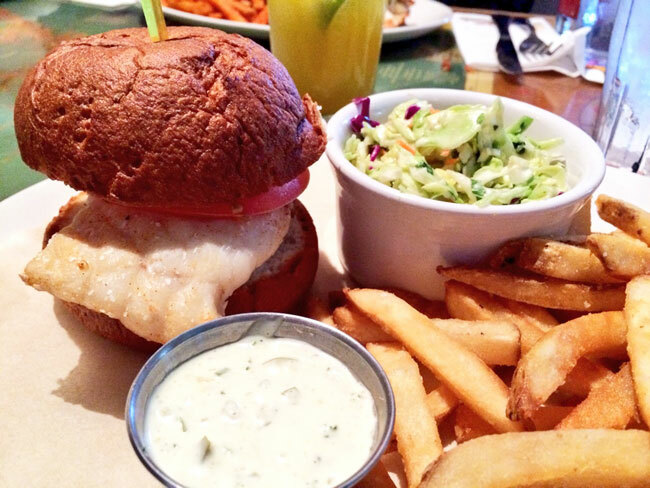 Our pick: the Key West fish sandwich, made with Panko-breaded red grouper and topped with sliced tomato, cilantro-lime coleslaw and jalapeno tartar sauce. Border Grill at Mandalay Bay, Forum Shops: Border Grill takes healthy eating pretty seriously. The restaurant uses organic black beans, antibiotic and hormone-free meats and locally-grown ingredients whenever possible. None of their ingredients contain artificial trans-fat and all seafood is sustainable. Border Grill also takes part in “Meatless Mondays,” encouraging guests to go meat-free once a week. Try items that are 80 percent plant-based ingredients like plantain empanadas and quinoa fritters. There are also vegetarian tacos, chile relleno and vegetable quesadillas, made with roasted poblanos, grilled asparagus, zucchini, fava beans and Mexican cheeses. Wild, 150 N. Las Vegas Blvd. : If you’re downtown and want a healthy, tasty meal, head to Wild, a restaurant that uses organic ingredients, gluten-free flours, hormone-free meats and cheeses. A healthy alternative to pasta is Emily’s Zucchini “Pasta,” made with with julienned zucchini, broccoli, mushrooms, tomato, organic marinara, basil, garlic and Parmesan cheese. Other great options include quinoa salad and kale salad. MGM Smart Plate: Counting calories? 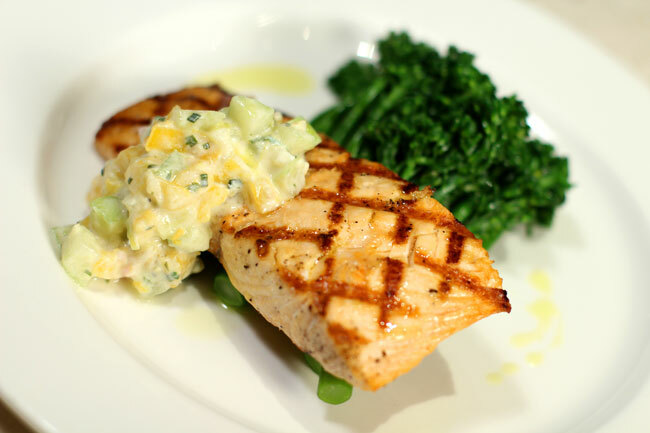 In 2013 MGM Resorts International made that a lot easier for dieters by introducing Smart Plate, a program that gives guests healthy menu items at 700 calories or less per dish. The calorie-conscious items are available on select in-room dining menus and at participating cafes in MGM Resorts properties. Smart Plate selections, designated on menus with a specialized logo, are updated frequently, offering guests new choices throughout the year. Among the Smart Plate choices we like are a blackened ahi tuna sandwich at Raffles Café at Mandalay Bay, served with a side of fresh cut fruit; and a grilled vegetable panini with Portobello mushroom, roasted red peppers, grilled squash and more at the Café at Monte Carlo. Grass Roots Juice bar, 124 S. 6th St.: This juice bar, located in the old John E. Carson motel downtown, serves superfood-based juices, smoothies and foods using organic ingredients sourced from local and regional small farms and farmer’s markets. It doesn’t get much greener than the Holy Grail of Greens, kale, spinach, dandelion greens, peach, lemon, microgreens, tangerine, green grapes, ginger, green cabbage and wheat grass. If that doesn’t make you feel healthier after eating it, we’re not sure what will. The restaurant also serves soups like Thai ginger and cucumber miso. And we suggest you try dessert. Grass Roots has some interesting ice creams like the apricot cayenne pepper, made with apricot, cayenne and white grape juice; or the strawberry tomato ice cream with strawberry, tomato and white grape juice.